Here are 96 exciting levels waiting for you to solve or backroute ! The pack already comes with the latest Lix version, so no need to download anything further. Stunning visuals! Compared with Lemmings tilesets, some Lix tiles lack powerful 3D-lighting, yet you have crafted great images with the Lix tiles. Some levels even thrive on the flat design. Study in Scarlet shows masterful tile grouping. From playing the NL version at Icho's, I know about the quality in the easier half of the pack. These levels are already challenging. I'm looking forward to explore the other levels. We can include this in the D Lix test versions, or maintain it as a separate download for now. It's your choice. I had a look at almost all of the levels from Planet and Sun. Each level, I basically played for 10 minutes, and if I didn't make good progress I'd move on to some other one. Exceptions are the last two of Sun and Planet 5, 6 and 10 (either because I'd seen them before or because they looked too daunting). I think some levels I backrouted pretty badly. But quite a few I found excellent and great fun. Of the ones I solved Hope and Despair is my favourite one. 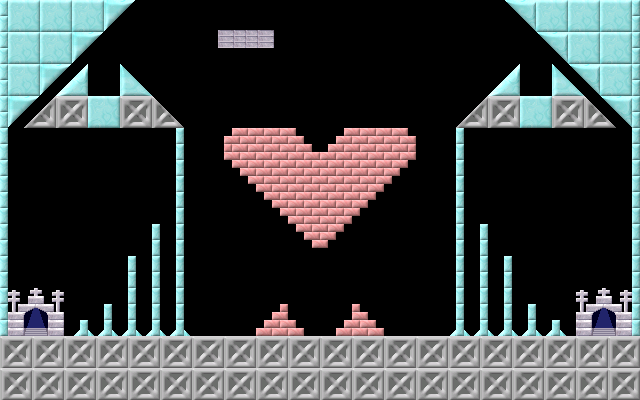 I'd like to write a bit more about some levels, but it's pretty late now and I probably won't have much time to play or write anytime soon, so I just want to get out what I have so far. But either way I've had a lot of fun so far and even the ones I haven't solved yet are quite intriguing. Five do not survive: It seems that I have to remove the batter. Adding it to require less timing was probably not a good idea. Construction zone: Backroute due to different digger behavior. Tomb Raider: Backroute due to slight terrain changes. Minimalistic Platforms: I already checked this approach, but appearently not in enough details - backroute. Toy Ship: Slight variation of the intended solution. Cubism: Again a glaring backroute due to subtly different terrain widths. Death of a Working Lix: Backroute. I never even considered this approach and was simply fortunate in the NeoLemmix version. Canonballs: The left-hand side is totally fine, but I will block the way you did the right-hand side. No matter what I try: Very interesting solution and completely different to mine. I have not yet decided what to do with it. Marble Temple: Again a backroute introduced by subtle terrain changes combined with less strict terrain checks for builders. Chinese Lemmings: Essentially the intended solution. Icy Smell of Steel: Glaring backroute to both the Lix and the NeoLemmix version. Given that a lot of people found other much harder (and acceptable) solutions this is quite surprising. Broken Symmetry: Again subtle changes in the terrain made this backroute possible. Lament of Innocence: Acceptable alternative solution, that was already found for the NeoLemmix version. Divide & Conquer: Backroute, but given the huge amount of backroutes for the NeoLemmix version, this is not surprising. Advanced Earth Cube: Backroute, due to a slightly thinner gap to bridge. Builders Prohibited: Another backroute, this time caused by my changes to allow for fixed SI. Heart for Lix: I tried this backrouty approach, but couldn't make it work myself. Thanks for showing my that it is still possible. Edge of Death: Same here. Fall and Never Live: Totally my fault. This backroute was already found for NeoLemmix, but only after I converted the level. Then I forgot to fix the Lix version. Here is version 1.1 of NepsterLix with all backroutes found by geoo and Simon fixed. Here is version 1.2 with further fixes for backroutes found by Ramon and IchoTolot. Moreover imploder counts were reduced when they could never be part of a solution. Version 1.3 with fixes for backroutes found by Simon. Version 1.4 fixes more backroutes Simon found in the Moon and Sun rank. Version 1.5 fixes some backroutes by geoo and Simon. Some levels in the last two ranks got reordered. And already version 1.6 fixing 14 backroutes that Simon already found a while ago, but only sent to me a few days ago. NepsterLix 1.6 is now part of the main D Lix download. All levels are proven solvable. I'll continue to watch this thread for updates. See the first post for version 1.7 of NepsterLix. If you are using a lix version of 0.7 or newer, you should update this pack. 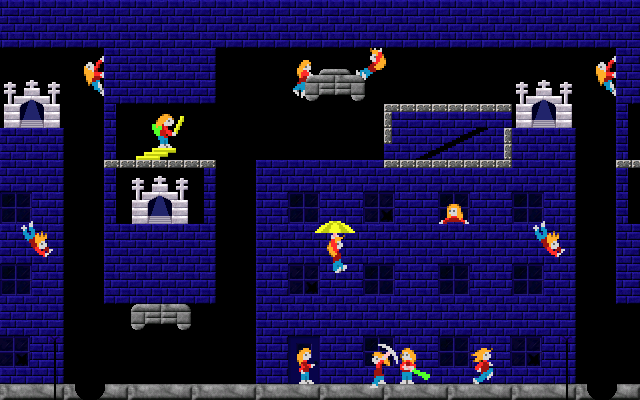 - New level "Haunted Walls". - Moved level "We all fly down" to Outtakes, because the new digger mechanics make the solution very fiddly. - Moved "Construction Zone" and "Woodworms" a rank down, to make place for the new level. - References to oriental and occult pieces point to the new piece names (thanks to Simon for fixing that). - The three levels in the oriental style ("Don't feed the frogs! ", "Travelling lix" and "Chinese Lix") are recreated with the new pieces. - Backroute fix to "Blockers forever". I removed the download option of this pack from the first post, as Lix now ships with the latest version of the pack and the version in this thread wasn't up-to-date anyway. I still greatly appreciate any feedback in this thread, though. Attached solutions to 19 out of 20 levels of the Moon rank. Most of them are done in 0.9.2 and some in 0.6.x but the ones of 0.6.x attached should work in 0.9.x as well. It was already very hard for me despite being the first rank. Apart form "Study in Scarlet", which I haven't solved yet, I found actually the first two levels quite hard. I liked "Another Miner Problem", "Earth Cube", "Blockers forever", "White Wonder" and "Construction Zone". I'm not sure if I solved "Colored Cube" intended since it is in a particular way precise but everthing worked out. For "The Prisoners" I saved the batter and climber, so I don't know if it was the way to go. If "Horror Ping-Pong" is fully intended then it's quite precise since I only got it with early basher assignment. If "Don't feed the frogs!" is intended then it's very bruteforcy. It's a nice trick to close the imploder gap but you have to go for it in the hope that it works out. If "Direct Misdirection" is basically intended then it's quite special what one has to do. I probably did it overprecisely but nevertheless. In "Maze-Lix" it was hard to coordinate all actions. I at first did multiple replays and copied them together but the attached replay is a reproduction of it in one go. As I knew a way it wasn't that bad anymore. Thanks for the replays. Technically the first rank is the "5-of-all" rank, and at least its first levels are easy intoduction levels. But I agree that the Moon rank is already rather difficult. I am just terrible at creating easy levels. All solutions I don't comment on are absolutely intended. Another Miner Problem: Backroute, even though you liked it. Colored Boxes: Completely different from the intended route, but this level is incredibly nasty to fix, so I might just accept your solution as an alternative one. Blockers Forever: Accepted alternative solution. You need Blockers this time: Backroute. Lix Playground: Backroute. While this level has a lot of different solutions, yours misses the key characteristic of all others. Jump in the Ring: Interesting alternative solution. Haven't seen this one before. Prisoners: Not one of the two acceptable solutions. So I really don't know whether I want to keep it or not. White Wonder: While I am glad that you liked that level, your solution is a 100% backroute. Don't feed the frogs: The intended way is far less precise. But your solution seems nevertheless close enough that I will keep it. I might raise the SI to make it easier to execute your solution, though. Direct Misdirection: No, that is a backroute. If I had intended that route, then I would have made the execution far less precise. Miner Preservation Society: Shame on me for not seeing this backroute.